This is what you need to take a good little break from whatever you are doing. With chocolate, strawberry, pista flavoured milk, enjoy the delicious experience from the house of Thirumala. Check out more flavours right here. Dahi or Curd is the most staple diet when it comes to the Indian household, and we provide you with best, creamiest and high-quality curd. 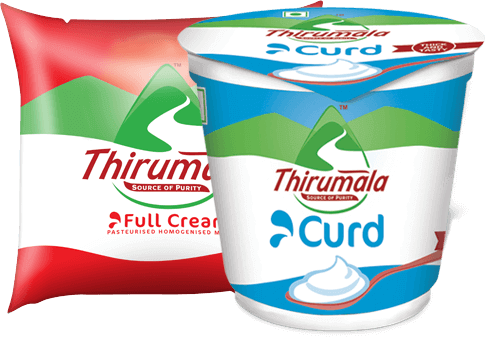 Prepared with pure and pasteurised milk under the right conditions, Thirumala curd is not just yummy but also incredibly healthy. 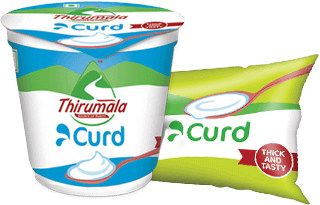 Rich with calcium, protein and vitamins, Thirumala curd is beneficial in numerous ways. The good bacteria in curd helps you improve your digestion and helps you stay, fit, fine and cheerful always. With the purity and nutritional goodness of milk, Thirumala strives to bring smiles to the simple moments in your life. Our milk and milk products are simply the best way to cherish those lovely moments and add daily magic to that daily-cious milky life. Nothing can lift up your mood like having your favourite flavour of ice cream. The delightful, refreshing scoop of ice cream is a gift to self on a regular day. The zesty taste of different flavours is all you need to indulge in and make great memories. With Thirumala ice cream, share happiness and relish all the great times of your life. Explore a burst of flavours right here! Tirumala Milk Products Pvt Ltd.
New no. 75/8, 200 feet road, Thirumalai Nagar Extension, Ponniamanmedu, Madhavaram, Chennai 600110, Tamil Nadu, India. To know more about the latest from Thirumala, subscribe to our newsletter. Thank your for your enquiry.Our executive will get back to you. Copyright @ 2017 Made with All rights reserved.